"We strive to take beautiful elements of nature and put them into a context where people will take the time to appreciate their perfection." Michael and Christine Adcock's work integrates their individual media  pottery and basketry  into an organic whole. Each hand-throw or slab built vessel is placed in a larger clay jar called a sagger. Various combustible materials, including mineral oxide and salts, are packed into the space between the two vessels. Up to twenty saggers are firing in the kiln. The resulting gasses and smoke create the range of tonalities on the clay surface. 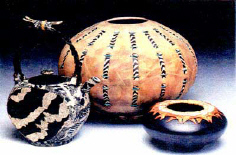 When the pots are cooled and removed from the kiln, fibers are glued, stitched, inlay and woven in. Their goal is to create vessels that successfully integrate Christine and Michael's individual media and to reveal and enhance the inherent beauty of each. Some of their work can be seen at www.villagegalleries.com/adcock.html.